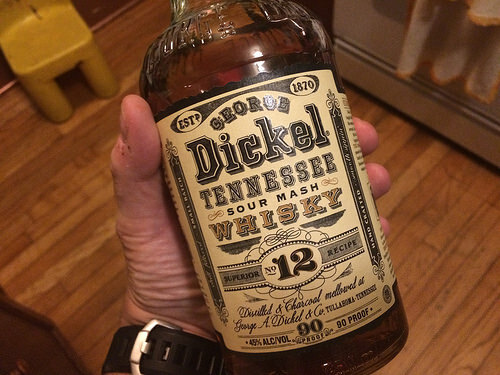 Like most U.S. distilleries, George Dickel had an interrupted history. It was founded by its namesake, a German immigrant who became a successful merchant, in 1870, and flourished until Tennessee enacted Prohibition ahead of the nation (and two years ahead of neighboring Kentucky) in 1909. 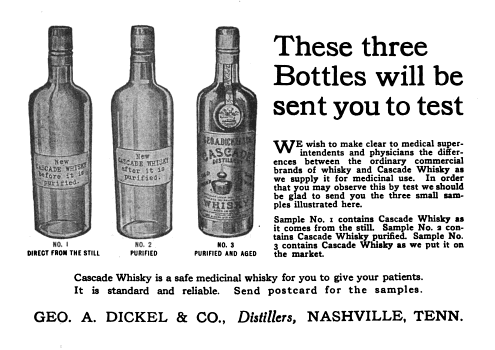 The Dickel brand survived Prohibition by being sold as a medicinal spirit. After Repeal, Schenley bought the rights to the recipes and sat on them for several decades. The distillery was finally rebuilt in 1958 by master distiller Ralph Dupps and is supervised today by his successor, John Lunn. Dickel is now owned by Diageo, and is the smallest producer of premium spirits in the U.S. at 500,000 cases annually. That may sound like a lot of whiskey, but to get an idea of the scale of the operation, just compare it to the other significant distillery in Tennessee---Jacks Daniels, which cranks out more than 10 million cases annually. Because of the size, Lunn is able to run a hands-on, personalized operation without the use of computers. The process of charcoal filtration is what distinguishes Tennessee whiskey from its Kentucky counterpart, and all the charcoal used at Dickel is made on site from sugar maple wood. In addition, the historical George Dickel noticed that whiskey he made in the winter tasted better than what he produced over the summer, so the distillate is chilled down before charcoal filtration. For what it’s worth, the Dickel brand refers to itself by the Scottish spelling of whisky rather than whiskey, because the original Mr. Dickel believed that it compared favorably to the best spirits produced in Scotland. The Dickel distillery is located in Cascade Hollow, in Coffee County, an idyllic and delightful place to visit. The lineup of Dickel whiskies begins with Cascade Hollow ($18), bottled at 80 proof (40% alcohol) after four years of barrel age. The spirit is light, floral and spicy, almost reminiscent of Scotch but with an undertone of sweetness from the corn. The #8 Black Label ($20), also 80 proof, spends 6-8 years in cask. While the nose is richer than Cascade Hollow with hints of vanilla and caramel, it shares the same floral qualities on the palate---powerful and spicy, it lacks the fatness traditionally associated with Tennessee whiskey. The #12 White Label ($25, 90 proof, 8-10 years old), on the other hand, is rich and plump in the mouth, almost unctuous, with flavors of caramel, baking spices and pepper balancing the richness---a spectacular whiskey. The product line culminates with the Barrel Select ($40, 86 proof), aged at least 12 years in casks hand-selected by John Lunn. Powerful and concentrated, it has a sweet texture highlighted by flavors of caramel and cinnamon: delicious sipping whiskey, the definition of a style. Build in a rocks glass, swizzle with a small amount of crushed ice, then add 1 cube. Combine all in mixing glass. Stir and strain. Muddle sugar with bitters and water and add No. 12. 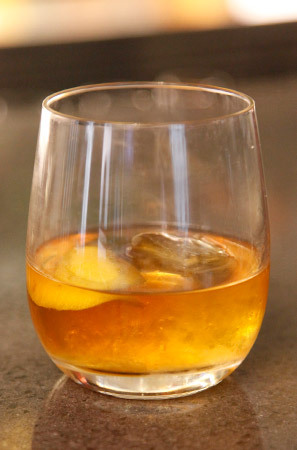 Shake with ice and pour into an old fashioned glass. Garnish with orange slice, lemon twist, and cherry.